When “The Wintermoon…” was released, it felt like a ‘friendly-slap’ on the forehead of the black Metal scene at that time. 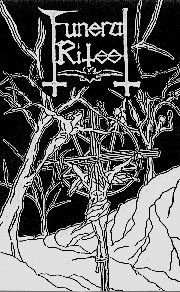 Everywhere you could only find Norsk-influenced black Metal demos in abundance then, something that could alter a bit of that linearity would be very much welcomed, and of course, appreciated. Thus came Funeral Rites with this demo; heavily, proudly and brilliantly done in awe and respect for the old, traditional black Metal sound. Important to mention too, that they’ve done it convincingly. This interview emphasized on that period of Funeral Rites. Kentaro speaks on behalf of them. Funeral Rites is definitely a band that I don’t know much of. So Kentaro, brief us the history of Funeral Rites. Has the line-up changed a lot of times? How did you get the name ‘Funeral Rites? It seems that a lot of bands has either the word ‘funeral’ or ‘rites’ as their name, do you think that by using this name your band will get a better recognition? Funeral Rites is a Japanese black Metal band. The band was formed December 1994. 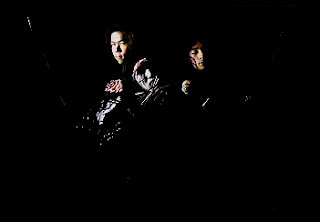 The first line-up was Kentaro (guitar&vox), Nobuyoshi (guitar), Takehiko (bass) and Masahiro (drums). Our first gig was in March 1995. At that time we played cover songs of early thrash Metal bands like Sodom, Bathory and Celtic Frost. After the first gig, our line-up was changed to Kentaro (bass&vox), Hiroyuki (guitar) and Masahiro (drums). After that the guitarist was changed to You and Yuki (keyboards) became our member. Then December 1995 we released 1st demo, “Demo 1”. This demo tape get good responses. We managed to make friends with many black Metal bands and fans and make distribution contracts with some labels. And October 1996 we released 2nd demo, “The Wintermoon…”. The present line-up is Kentaro, You, Masahiro and Aki. Our band name Funeral Rites was named after the song “Funeral Rites” from Sepultura. This song was contained in their 1st album “Morbid Visions”. I like only their first album. So our band name was named after it. I know many ‘funeral’ songs and bands like “Funeral Fog”, Funeral Winds, Funer(e)al Moon and etc. But I’m proud of our band’s name because it is simple and quite cool. I know another Funeral Rites from Poland. They seem to have released their first album, but I have never heard it. They must have the same sense as us. Let’s talk about “The Wintermoon…” demo. How’s the response? Satisfied with it? “The Wintermoon…” is our second release. It was recorded September 1996 and released October 1996. In this demo there are many middle tempo numbers and keyboards part than our first demo. The responses to it is good. But I’m not satisfied with it yet because our second demo was released just now, last autumn. I think Funeral Rites are influenced by old black Metal bands. Is it true? I wonder why it is such a norm in Japan. I mean, most of the other Japanese black Metal bands like Sigh and Abigail are also mainly influenced by the old bands. Yes, we are influenced by old black Metal bands (Sodom, Bathory, Hellhammer, etc). and today’s black Metal (Mayhem, Emperor, Burzum, etc.). And in Japan almost all the black Metal bands are greatly influenced by old black Metal. Sigh plays many cover songs of Venom and Abigail plays cover songs of Bulldozer in their gigs. We play cover songs of Sodom, too. I think the reason why is because there are few good today’s black and thrash Metal bands (thrash Metal was dead long ago). Many of today’s black Metal bands are imitations of today’s black Metal bands like Emperor, Satyricon, Cradle of Filth, Marduk and etc…. Against it, many old black Metal bands had originality. So we listen to old black Metal very much and we are greatly influenced by them. But we must not become an imitation of old black Metal. Today’s black Metal bands including us must make original black Metal music. I think Sigh and Abigail have their original style. We always try to make our own original style too. On the demo there’s a cover of Sodom’s classic “Blasphemer”. Sodom is one of the greatest black Metal bands that influenced us. Especially I like their debut mini, “Outbreak of Evil” and first album “Obsessed by Cruelty” very much. In our gig we don’t have any permanent keyboards member. So we play many cover songs of Sodom besides our original songs and recorded their classic “Blasphemer” in our second demo. I noticed that keyboards are widely used on your songs and it’s quite successful. Does keyboards remain an integral part of Funeral Rites’ compositions? Many keyboards parts give our songs atmospheric and illusional impressions. But I have not ever studied music theory and keyboards (I write all of our songs). So our keyboards parts are difficult especially. And I try not to rely on keyboards too much because I think the most important point is guitar riffs if you’re talking about Metal music. But it is true keyboards parts are important to our music. What are your lyrics dealing with? How important is the lyrics to you? Why don’t you sing in ‘Nihongo’? Lyrics is very important to black Metal. My lyrics deal with Satanism, many satanic stories, human beings and etc. They are based on my belief, but not based on realistic problems. I don’t sing in Japanese language (‘Nihongo’) because the pronunciation of Japanese language does not go well with Metal music. So I don’t sing in Japanese language. Judging from the demo, I think Funeral Rites prefer the slow, midtempo, doomy type of black Metal. Yes, our second demo include many middle and slow tempo numbers by chance. But our first demo include fast black Metal numbers. On the whole half of our songs are fast numbers and rest half of them are middle or slow numbers. Our next release will include fast black Metal number. Your demo cover. I think it’s too simple and look like it was done in a rush. I would like to know the hidden messages behind it. Some says the logo is not that attractive too. Our second demo cover was painted by You (guitar). It may be too simple, but I think it is easy to see and it’s attractive. I like it. The crucified Christ means the fate of fools. I don’t like a logo that is difficult to make out. Many great bands have simple logo. I like a simple logo too. I don’t think our logo is not attractive. If there are people who think our logo is uninteresting, I don’t take notice of them. The music is important than the logo to us. Some people tend to agree that an eastern black Metal band will never have the capabilities and achieve the so-called ‘evil’ of the bands from the north and the west. I would like to hear your comment. If they think the eastern black Metal bands will never have the capabilities and are inferior to the north and west bands, they are people who cannot think progressively. Because almost all the black Metal bands came from the north and west till now, they must think so. I don’t like to stick to that old custom. They should appreciate the band regardless of the country if the band makes good music. I think many eastern bands have originality and scarcity value because there are few eastern black Metal bands. Tell us more about the Japanese culture. Is there any traditional belief of spiritualism, Satanism, occultism, etc? If there’s any, I hope you don’t mind to tell us a bit about it. In Japan many people make much of spiritual power. It’s called “Konjo”. Many people say that spiritual power bring about a miracle. I think so. Satanism and Christianity are not familiar with many people because religion is separated from our educational system (of course there are exceptions…). So many people grow without being conscious of religion. But I passed my school days in mission school and became aware the contradiction of Christianity. So I became a Satanist. I think Satanism is a metaphor that a crisis of our world. Occultism… there are many occult movie and book in Japan. I like occultism, too. In Japan there are original occult stories, “Kwaidan” written by Rampo Edogawa. From your personal opinion, what can you describe about this whole universe and its creatures? This whole universe is wide. There are still many things I must know of. So I cannot describe it clearly. Give your personal comment on how a black Metal band should live their life as. Black Metal bands including us should establish their music style and their belief. And they should pursue originality without sticking to a fashion. What can you predict of the eastern Metal scene two or three years from now? Eastern Metal scene (especially in Japan) will not change because Metal music is not a fashion music and a number of people that listen to Metal music seems to be in stability. The originality will be kept instead. Can we expect a Funeral Rites album soon? We will release third demo or an MCD this summer. But we won’t be impatient to get a success for example an album deal. We will continue making our music from now on. We are a black Metal band forever. Death to false black Metal!! !